On Rode Trip, there are no taboo topics and we love when people ask questions because you’ve often thought of things that we have not. In fact, we’re even offering up free vacations for questions that haven’t been asked yet…Amanda has three trips in queue, way to go for a very inquiring mind! We’d like to share questions and answers so that everyone can truly live vicariously and learn a bit along the way. Our latest, but certainly not first, question comes from Newington, NH. “Have you broken in the new toilet yet?” Why, YES, we have! 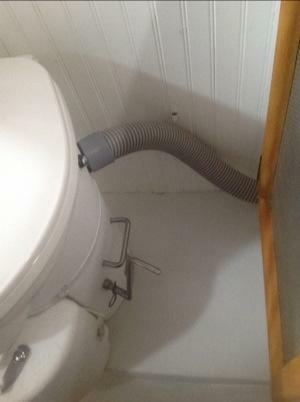 When we bought Rode Trip, the toilet/plumbing was added to the ‘to be improved’ list. The plumbing already smelled horrible, like a sulfer smell, and we were concerned about the hazards of blocked plumbing lines which we had read could be quite a stinker to fix. Naturally, Brian assigned the first of my First Mate tasks to be overseeing this system. After much research we decided to be rid of the plumbing and install a composting toilet. 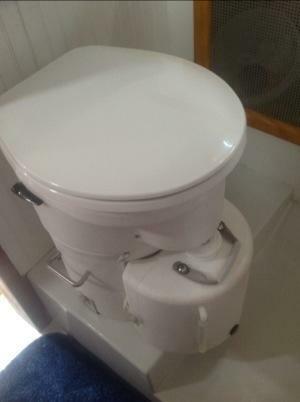 The toilet is installed into the bathroom floor so it’s nice and stable. It has a ‘liquids’ tank which you can see on the front. And it has a ‘solids’ tank directly below. The liquids tank is quite simple, just empty when necessary, of course 3 miles offshore. Sugar may be added to this tank to alleviate any odor. The challenge for boys is banking their shot into the liquids tank, since it is on the front of the toilet. If the waves and winds are rolling boys sit down! Girls just do our thing, finally an easier scenario for us! The solids tank is prepped with peat moss and enzymes, those same enzymes that are put into septic tanks. Then when deposits come, just a turn of the handle to bury/stir the contents, and the composting begins. The solids tank will last for several weeks and continue to break down while providing additional room for deposits prior to emptying. Of course this led to Newington’s next question, “How does it smell?” We had read from other composting users that the smell was minimal, in fact much more appealing than typical plumbing. The system is vented via fan installed through the deck. Tubing from the toilet runs under the cabinet and up through the counter (expertly installed by the captain himself.) The fan runs all the time to keep the circulation going. Thus far, no bad smells. This has been confirmed by the SS Odor Inspector who will make several more spontaneous trips aboard to monitor. Keep those inquiring minds working and we’ll keep figuring it out! Okay; I have a question about that toilet thing. Do you plan on starting a vegetable garden on the front deck with all that great compost? Fresh tomatoes go well with the sushi from that tuna you caught while trolling with that new handline and turned into sashimi. Hope that one wins me a vacation! Seriously, just did a quickie through your photos and I’m impressed. Do you hire out? I could use some help when I buy my trip-around-the-world sailboat. Are those handles on each side for holding on in the rough seas? I’m proud of you, Steph for writing such a technical blog. Oh, yes….and everything looks so sparkly clean. Newington, NH is very happy with your informed response on this question we know that is on everyone’s mind; In your defense, when we came as informal odor inspectors yesterday, we could not make any aromas that were displeasing on the boat. That being said, we are the soon to be caretakers of your bathroom fan, and promise to get it to you as soon as winds and roads bring us together (hopefully really soon, we know that Brian gets kinda funky after eating some of that Mainer fried food 🙂 ). Good to hear that the Portsmouth winds had your sails filled—-Safe travels, and see you soon. A future question to ponder, the RodeTrip insignia—we’re just itching to see the tattoos! I liked the comment: “naturally, Brian assigned the First Mate tasks to oversee the system”. How nice! Steph, I hope that your FM tasks become a little more glorious along the way! 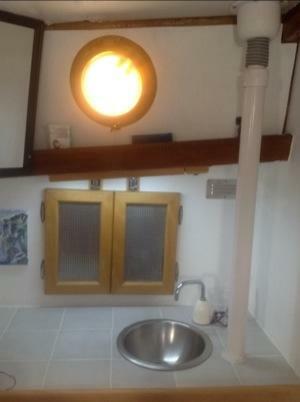 Hmm…we do have a sprouter in the galley, but expanding the garden is a good idea. Might need more tupperwares for planting. Well, we only take photos after the maid has come.